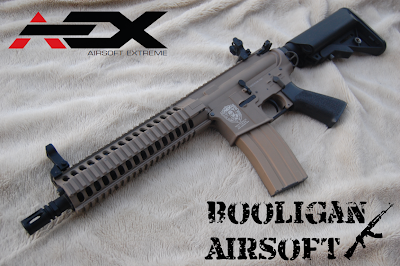 Airsoft Extreme is one of the oldest and most trusted airsoft retailers, and their connections with airsoft manufacturers allow them to do things that other companies can't. Their latest line of custom built guns is the product of this arrangement, and they really knocked it out of the park! Today, we will be taking a look at the AEX Warfighter AX, which combines a short barrel with an extended free float rail system and a mock gas piston system. The Warfighter is designed for expert players, requiring a buffer tube LiPo to function. Keep reading for more info on this custom AEG by AEX! I was sent this AEG directly through AEX, who has it available HERE, currently priced at $289.99. Right now, it's for sale as a Player Pack, which includes 2 bags of BBs, a single point bungee sling, a 7.4v buffer tube LiPo battery and charger, and a LiPo charging bag. It's a pretty smoking deal, all things considered, so jump on this deal while you still can. Big thanks to AEX for their continued support of our reviews! The AEX custom AEGs are full metal ARs available in a variety of barrel lengths, rail configurations, and colors. The one being reviewed today is the Warfighter AX in Tan. This model features a replica M6A2 rail and gas piston system which really add to the modern tactical look of this thing. Internally, this thing is fitted with some really high end components including a modified V2 gearbox, 9mm ball bearings, QD spring change system, high torque gears and motor, and a 6.03mm tightbore barrel. Featuring a tan finish with contrasting black parts sprinkled throughout, it really looks awesome on and off the field. The Warfighter comes packaged in a simple box with a foam lower section. There are a few stickers identifying the model of the gun held inside and everything survived shipping without any issues. I pulled the gun out of the foam lower and was VERY happy with the rock solid feel, as well as the extremely well replicated rail and gas piston system. The package I received is the base package, not the "Gamer Package" currently on special. As such, it only included the gun itself, a single hi-cap magazine, and a cleaning/unjamming rod. I needed to provide my own LiPo battery, and my trusty Tenergy 11.1v 1000 mAh 20C LiPo pack works perfectly. Length of Pull: 11.5" - 15"
Externally, this gun looks absolutely top notch, from the real steel type LMT style crane stock to the mock gas piston system, the thing looks like it belongs on a gun range, not on the airsoft field. The tan coloring looks great with the contrasting black buffer tube, stock, pistol grip, sights and barrel assembly. The paint finish looks great for the most part, however, there are a few small spots with slight defects in the paint. Also, the paint may scratch during use or when disassembling the gun, so take care if you want your gun to look absolutely pristine. The stock is different than most other airsoft crane stocks in that it doesn't have traditional battery compartments to hold your airsoft battery. Instead, it uses real steel type CR123 storage tubes which pull out of the stock assembly. Your battery space is limited to the buffer tube, so this is pretty much a LiPo only gun. The buffer tube is a 6 position unit and had some difficulty mounting up a Magpul PTS stock that I had, due to the holes being too small for the locking rod. At the base of the stock, you'll find an ambidextrous sling mount. The receiver is a standard AR pattern, flat top unit which is made entirely out of metal. It has a locking bolt system so if you pull back the charging handle, the faux bolt carrier will lock back to give you easy access to the hop-up. To release it, simply push the bolt catch on the left side of the receiver. The receivers are attached using the front pin and two large locking lugs at the rear of the upper receiver. The controls are standard M4 controls, including a 180 degree sweep selector switch with safe-semi-full auto modes, a magazine release button located on the right side of the receiver, and the aforementioned bolt catch on the left side of the receiver. The pistol grip is a nicely textured Tango Down type unit with a flat head screwdriver adjustable heat sink base. The polymer pistol grip feels great in your hand, but does have some slight casting marks which you can easily shave down. The free float rail system is a M6-A2 type unit which is constructed out of metal and attaches very securely to the upper receiver. Like the real unit, you can access the nicely replicated gas piston system by unscrewing the two front screws and lifting the upper rail section off of the lower. Further disassembly is accomplished by unscrewing the four screws located at the base of the rail. The faux gas piston system looks absolutely fantastic, but is merely a cosmetic piece obviously. The one piece metal outer barrel has no wobbles or freeplay, however, mine is slightly off center. It is terminated in a 14mm- threaded muzzle fitted with a metal, orange painted birdcage flashhider. The gun certainly looks the part! AEX includes Troy type flip up iron sights which are VERY well replicated, down to the locking system featured on the real units. There are some convincing markings located on each unit, and the metal construction means they should last damn near forever. If iron sights aren't your bag, you have plenty of uninterrupted rail space on top for mounting a wide variety of optic setups. There are several AEX trademarks located on both sides of the receiver as well as a unique serial number located on the left side. The trademarks are laser engraved and they really look great over the tan finish. The included hi-cap magazine holds about 300 rounds and has a slightly different tan finish than the rest of the gun. This helps add a little bit of contrast to keep the gun from looking like one giant chunk of tan. I didn't run into any compatibility issues with any of the magazines I tested, and most of them fit in the gun very snugly with no wobble or freeplay. Rate of fire will obviously vary depending on your battery of choice, but with my Tenergy 11.1v 1000 mAh 20C LiPo unit, I got an even 20 RPS. Not the fastest I've ever seen this battery go, but honestly, for a gun shooting right at 400 FPS, this is kind of right on the money for this battery pack. Range and accuracy weren't bad at all, however, the gun really does beg for heavier weight ammo. Using .20g BBs, my shots would break to the left and right after only 80-90 feet or so. I loaded it up with some .28g Airsoft Elite ammo and spent a bit of time dialing in the hop-up. It liked this MUCH better, giving me a flat trajectory out to 150' with very little side to side deviation. The furthest I could comfortably engage my standard torso sized target with 90% accuracy was 165', which is pretty good for a gun with this barrel length shooting at this velocity in my experience. Accessing the gearbox is a relatively simple affair, however, you may need to get a longer screwdriver for the screw inside the buffer tube, as it's much deeper in there than normal. Other than that, the only other real difference from other M4s is that you'll probably want to tap out the pin holding in the bolt catch to remove the whole assembly in once piece. The gearbox is a V2 with a few minor modifications and tweaks, including 9mm ball bearings, a metal selector plate and a QD spring guide to swap out the spring. Inside the gearbox, you'll find steel gears, a ported cylinder and aluminum cylinder head. The piston is a yellow polymer unit with a metal head that is supposed to be ported, but on mine, not all of the ports were drilled through. In spite of this, I still had a great airseal. The air nozzle is equipped with an internal O-ring for even better airseal. The shimming and lubrication is top notch on this thing with everything moving very smoothly. Lastly, the spring guide is metal and equipped with a ball bearing system. The Warfighter comes with a 300x6.03mm tightbore barrel fitted in a metal hop-up unit. The bucking and nub are of a standard design, so upgrades are very easy to accomplish. Electrically, the gun has a motor that is advertised as being high torque, however, the magnets aren't terribly strong. Strange thing here, there is a faint marking of "Classic Army" on the motor that has been ground off. To be totally honest, visually, I think this gun is pretty damn perfect. After throwing a black metal flashhider on it, the look really is complete for me. Internally, the gearbox is very well built, so you shouldn't need to do anything to it to keep it running well. If you want to adjust the velocity for your specific field, you simply have to access the quick change spring system and toss a new spring in. The gun really is incredibly user friendly and is ready to run out of the box. AEX has changed things up big time with this run of guns. Honestly, most retailers' custom gun offerings are usually lacking, whether it's with boring looks, sub-par performance, or with crazy expensive prices. This thing gives you really outstanding externals, great internals, and a price that isn't absolutely insane. I'm genuinely impressed with what they were able to put out through the manufacturer that they contracted with for this gun, and I'm really curious to see what else they're able to come up with. Are the barrel threads - or +. Also, is the buffer tube mil-spec or commercial? I noticed you said you had a hard time attaching your ctr stock..